It’s a popular notion that breakfast is the most important meal of the deal, and that’s especially true when you have diabetes. It is essential for people with diabetes to control and sustain normal blood sugar levels by taking insulin and following a disciplined diet. An ideal breakfast for someone with Type 1 or Type 2 Diabetes must be low-glycemic, full of nutrients, and able to provide consistently regular sugar levels for hours into the day. Food for Life has healthy diabetic breakfast options that will not only help maintain the level of blood sugar, but will start your day feeling satisfied and energetic. Controlling blood sugar levels in the morning can often be a challenge since typical breakfast foods tend to be heavy on refined sugar and carbohydrates which can result in having a high blood sugar. Those who eat breakfast foods that are high protein and indigestible carbohydrates, such as whole grain barley, whole grain rye, and whole grain oats, tend to have lower, well-regulated blood sugar throughout the day. They also tend to make them feel fuller longer. Although diabetics should avoid foods that are high in refined sugars and simple carbohydrates, that does not mean that have to avoid a great, tasty breakfast. Food for Life has diabetic friendly sprouted grain waffles, sprouted whole grain cereal, and sprouted whole grain bread that include delicious flavors such as cinnamon raison, apple nut, blueberry, golden flax, and original. These sprouted grain products are high in fiber, protein rich, low glycemic, and much more nutritional than traditional breakfast foods to help maintain stable blood sugar levels. 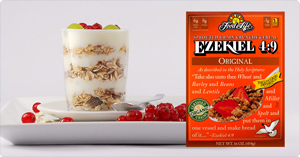 All Food for Life diabetic breakfast foods are certified organic. There are no artificial ingredients, no refined sugars, no GMO’s, no preservatives of any kind in any Food for Life products. Learn more about the healthy varieties of diabetic breakfast foods from Food for Life. Find a location where you can purchase some Food for Life diabetic friendly foods.